This December marked the launch of two new book projects I was glad to be involved in. Both of these projects support organizations that help make people’s lives better. The first of the books to launch was Indy Writes Books: A Book Lover’s Anthology. I was delighted when Travis DiNicola, the editor of the book, asked me this summer if I would contribute to this project for Indy Reads Books. Not only is Indy Reads Books my favorite bookstore in town, but their mission of supporting adult literacy is one I very much want to support in whatever way I can. Being asked to write about books, literacy, reading, reminded me that reading and writing have been loves of my life since before I could do either. I decided to write all new work for this project, and was surprised by the 4 very different poems that emerged in the month following the invitation from Travis. In “Household Gods”, which was selected as the first piece in the collection, right after the introduction and preface, I describe how books have been passed down to me and endure in my home as sacred objects. In “Romancing the Book,” I describe how books are an essential part of dating, and marriage. In “Immram Catherine Meehan (The Voyage of Catherin Meehan), I was delighted to find myself writing about my Irish great-great grandmother, imagining how she learned to read, imagining her voyage to America as a girl, connecting her story to ancient stories of heroic voyagers. And in “Trilogy” I found myself writing, in poem form, the fantasy trilogy I have often fantasized about writing. Since the release, I have enjoyed being part of book signings with the other authors. Indy Writes Books is now the bestselling book at Indy Reads Bookstore. It gives me a warm feeling of being part of a community of authors, our book being given as Christmas gifts all around the city of Indianapolis and beyond, and through this book, being part of an effort to help adults, who weren’t given access as children to books and reading, find the open door inviting them into this sacred world. 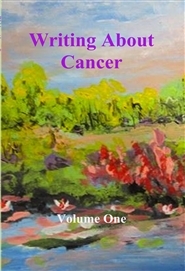 The second heart-warming book project to launch this December was Writing About Cancer: The IU Health Simon Cancer Center Literary Journal. I have been working all year with the art and music therapy team at IU Health Simon to make this narrative therapy project a reality, and I spent the fall editing this collection, putting together the various submissions we received, and turning it into a real book. Here is the description from the back of the book, and a link to the website where it can be purchased. I am proud of this book and look forward to seeing the impact it has on the cancer patients and family caregivers who are able to read copies of it while they are receiving chemotherapy, or are going through inpatient treatment. I will post more about this book as we start sharing it throughout IU Health Simon Cancer Center. You are currently browsing the Expressive Art Therapy and Dreamwork with Liza Hyatt weblog archives for December 2014.